Just call me World-Traveler-Extraordinaire. 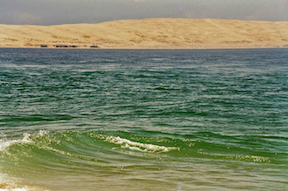 Two days ago, I took a boat-ride alongside the highest dune in Europe – the Dune du Pyla in the south of France. Yesterday, I strolled the banks of the Charles River in Boston. Today – I walked barefoot on a beach in Jamaica. Well, all that’s not entirely true. Although I feel like a globe-trotter – I’ve actually been visiting these amazing places from the comfort of my own home. Sound too good to be true? I know. I have some explaining to do. Recently, a close friend of mine has faced some serious health complications. Although I knew I couldn’t take this illness away – I needed to do something to help. But what? I searched the Internet. I leafed through my sizable collection of inspirational books and medical memoirs. What could I possibly give this friend to help them through this difficult time? And then, I remembered The Hypnotic Voice. Three years ago, a friend shared a CD of meditation/guided visualizations with me. At the time, I was over-anxious about law school and struggling to adjust to life with narcolepsy and the CD was designed to help with stress-relief. I copied the tracks onto my iPod but didn’t listen to it. No soundtrack was going to solve my problems or cure my narcolepsy, I thought. A few weeks later, I was listening to my iPod on shuffle while studying in the library, when one of the meditation tracks came on. I reached forward to skip to the next song, but something about the woman’s voice caught my attention. She was soothing, friendly and hypnotic. Always looking for an excuse to procrastinate – I decided to sit back, close my eyes and give the Hypnotic Voice a chance. In the exercise I listened to, she asked me to imagine a comfortable and safe place and insisted I spend some time really being there – looking at the scenery, feeling the air and touching my surroundings. I thought this was slightly hocus-pocus, but after the track finished, I felt refreshed and focused. My mood drastically improved in 17 minutes. How odd. Throughout law school, I listened to the CD often. It helped me tremendously to manage my stress. Since then, I changed computers and iPods and forgot about the Hypnotic Voice. Until last week, in thinking about what I could do to help my friend – I unpacked my old computer, found the tracks and pressed Play. As the familiar voice filled my room, I regretted having gone a day without her. 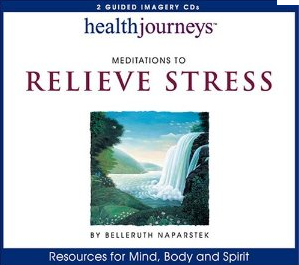 I highly recommend Meditations to Relieve Stress by Belleruth Naparstek (a.k.a. The Hypnotic Voice) for everyone (listen FOR FREE here). My favorite is Track 2: “Peaceful Perspective.” It’s simple and affective and just think – you too can leave the snow and cold behind to travel to your favorite places in the world for 17 minutes a day! Those are great CD's. Highly recommended.